In this last segment of a two-part episode, Ray talks with Michael Hardin (executive director of PreachingPeace.org and author of The Jesus-Driven Life) about Mimetic Theory and reading the Bible through the lens of Jesus. In this episode Michael continues to explain the Mimetic Theory and tries to help us understand it’s potential significance for believers in Jesus.Rene Girard, developer of the Mimetic Theory, has said that Michael is “a gifted and effective advocate who is able to make the Mimetic Theory and its application clear and understandable”. Thanks for part 1 (haven’t gone through part 2 yet). Anyway, does anyone have any ideas on how to rank the Book of Revelation on the Mimetic Theory meter? This book was supposedly written by the same dude who wrote the “God is love” line. The Book of Revelation – like Tina would have said 30 years ago; “what’s love got to do with it” and this book doesn’t seem to stream the Jesus lens to me. Thanks Raborn for your comment – I’m looking forward to your podcast with Michael on this difficult topic. I think it’s a topic that needs to be discussed in part because of its positioning as the last book (i.e. final words), and in part because it is a dispensationalists dream world. Also, a good one for 2012. To me this book is pretty much like a scrambled egg. Don’t get me wrong, it’s an excellent literary work and a great source material for death metal lyrics. Revelation was included in the antilegomena and in the fourth century when the canon was finalized, it was one of the last books to be accepted universally. Jerome (347-420), commissioned by Constantine to assemble together the accepted Christian writings, relegated it to second class. On a rabbit trail note, in the letters to the churches, references are made to unknown groups (Jezabels/Balaams/Nicolaitans) whose doctrines Jesus will come to fight against if not repented of. We have no record of what these diabolical doctrines were (i.e. wearing Nikes?). It doesn’t seem that some of the brothers/sisters in Rev 2/3 even recognized what it meant to be led by the Spirit. What is even more confusing is that Christ’s answers seem ungraceful and are more like an OT response (for example Rev 3:5). Jesus, the personification of love (1 Cor 13) and the finisher of our faith (Heb 12:2), blotting out their names from the book of life – ouch. I love it when things about Jesus bother me for years and then I hear of someone who has written a book about that very subject! I really enjoyed this conversation but can you help…I live in the UK and I seem unable to find a way of buying Michael Hardins book. It’s not on Amazon, Kindle, etc. Can you point me anywhere? 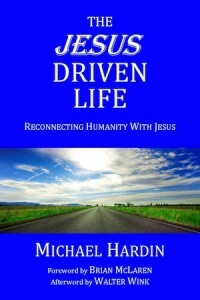 You can order The Jesus Driven Life at http://www.thejesusdrivenlife.com. We ship to the UK frequently. We will also be in the UK May 8-21 2012 in/near London, Glasgow and then Wales. After listening to the first, I have some sympathies but also hold reservations. I’m not saying Michael or Rene is wrong only that I disagree. But from the first installment, I doubt I fully grasp it. On to part 2. This comment has been removed by request of the poster. He has informed me that his email account was hacked and he did not post this comment. How does one respond to such an ad hominem attack? This kind of attack does not belong on an intelligent site like BtB. Not only does Izzy get the book completely wrong, he attributes to me things I would never say. Some Christians have a ‘concrete’ mindset: all mixed up and permamtly set. Izzy, I won’t try to speak on behalf of the author as he is more qualified than me to defend his work. Instead, I am curious to understand why God’s justice should be described on a human level where a deity becomes so offended that he has to fry people as a form of justice. This seems a lot like stories about the flood (re Noah’s time) that originated in pagan cultures where they describe that the cause of the flood was that their deities couldn’t sleep because humans were too noisy so they got pissed off and drowned them. Am I trying to imply that justice means Jesus just wants you to go pet lambs? Reconciliation in the kingdom/next life might not be an easy process for someone who had been for example, a serial killer. Reconciling with victims face to face might in fact make roasting seem like an easier option. Yet miracles like this can only be accomplished under the guidance and grace of a humanly indescribable glorious God. I’m not trying to change your view (snowball’s chance in gehenna, right? ), I’m just saying that nonviolent justice does not have to imply a scenario that can be described as “comfortable”. What if the rest of the Bible is God’s answer to Cain’s question? Thank you, guys, SO much for this podcast, and this great interview with Mr. Hardin!